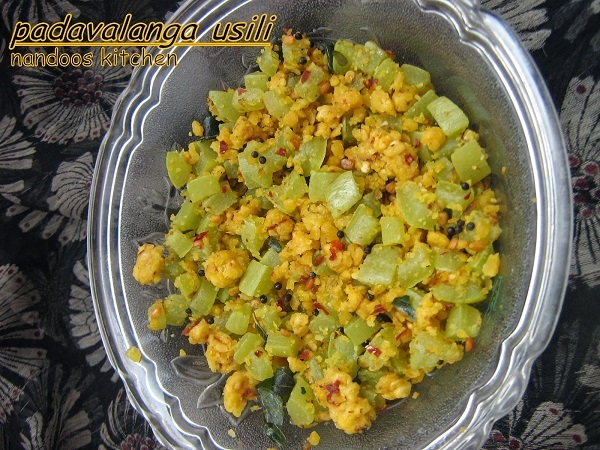 Paruppu usili is a popular iyengar dish which is made with lentils and vegetables. 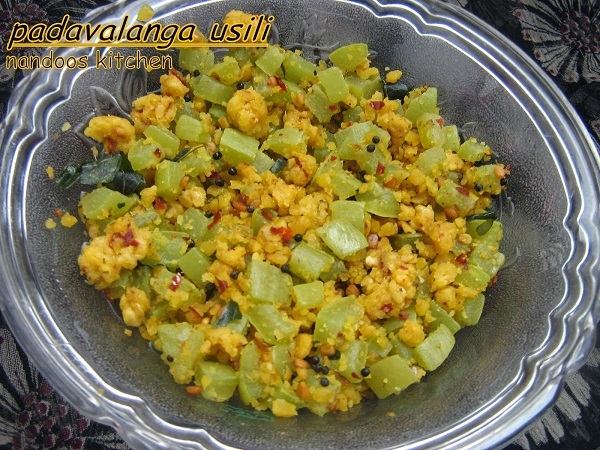 Usili is usually made with vegetables like cabbage, banana flower , cluster beans and so on. I have always wanted to make usili and today, I made it using snakegourd. 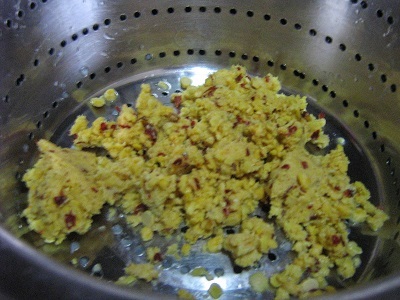 I had plans to make usili using cabbage but I had cooked cabbage yesterday and didn’t want to repeat the same today. So tried with snakegourd and believe me it was really tasty. 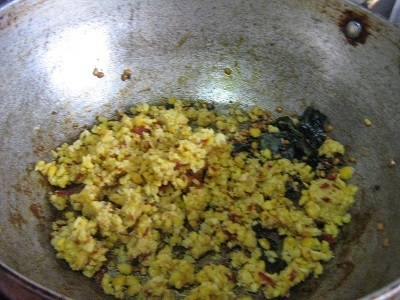 I always make mezhukkupuratti or thoran for lunch along with curry but loved making usili today. Now to the recipe..
1. Clean snakegroud, peel off the skin, chop it into small pieces and keep it aside. 2. 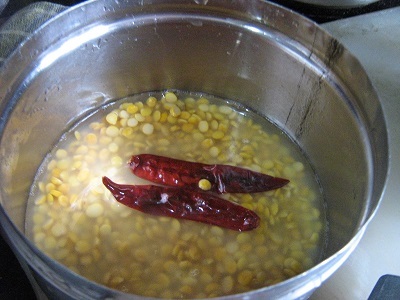 In a bowl, add channa dal, toor dal and dry red chilli. Add little water and soak it atleast for half an hour. 3. 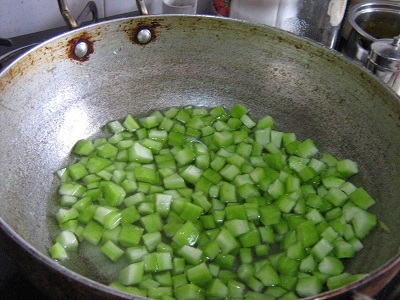 Meanwhile, cook snakegourd with enough water and salt. Boil it nicely and wait till it gets cooked and the entire water is absorbed. Once cooked, turn off the stove. 4. 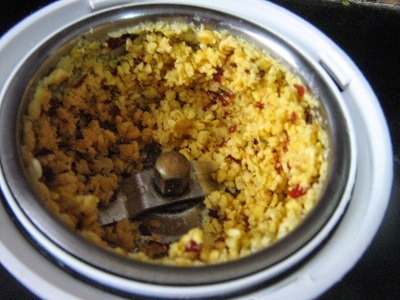 Drain water from the dal, grind it without water to make a coarse mixture. 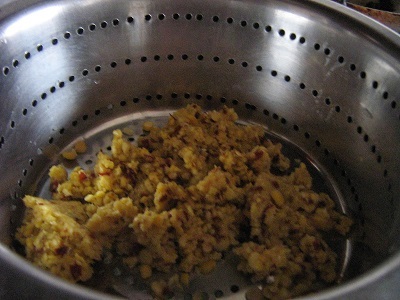 Boil water in an idly pan , spread the coarse mixture on the steamer plate and steam cook it for 5 – 6 minutes. Allow it to cool and then crumble it with your hands. Set it aside. 5. 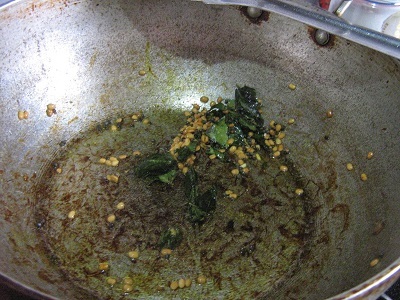 In a kadai, heat oil, splutter mustard seeds. Add all the ingredients given under “for tempering” and saute for a few seconds. 6. 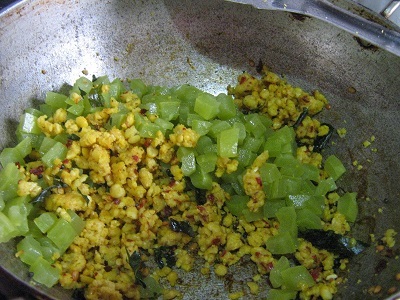 Now add dal mixture, saute till it becomes golden brown color, and then add cooked snakegourd. Add required amount of salt. Cook for another 4 – 5 minutes till the dal gets mixed nicely with the veggies. Turn off the stove. 7. Snakegourd usili is ready. This can be served with rice and any curry of your choice.